Not to be confused with A Bone to Pick. A Dry Bone to Pick is the first level of Teehee Valley in the Minion Quest: The Search for Bowser mode in Mario & Luigi: Superstar Saga + Bowser's Minions. 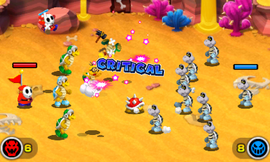 This level consists of three battles; all of them feature many Dry Bones in the front lines, as well as a Dry Bones captain. This page was last edited on April 19, 2019, at 16:41.